L 11 1/2″ (29 cm). Description: Sexes similar. 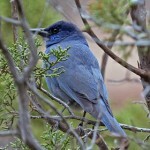 Head, crest, back, and throat sooty gray; rest of body dark bluish-gray; tight black cross-barring on secondaries and tail; variable lightly streaked eyebrow, chin, and forehead markings. 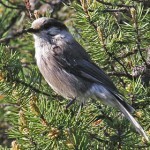 Juveniles are duller, with grayish underparts. Habitat: Montane coniferous forests or mixed forests and woodlands. 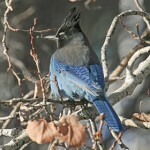 Sometimes seen in city edges and feeding stations during the fall and winter. Where in Nebraska: Very rare vagrant in Nebraska. Most often seen in west, but also seen in Keith, Lincoln, Logan, and Lancaster Counties. 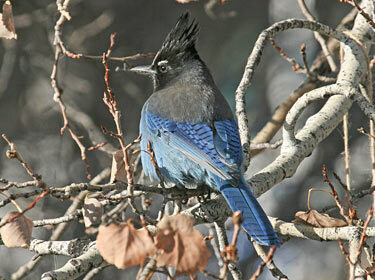 Field Notes: Occasionally hybridizes with Blue Jays where their ranges overlap in the eastern Rockies. Fun Facts: Complex songs can imitate birds, squirrels, cats, dogs, chickens, and some mechanical objects.